Our Tour started on January 11, 2010 at 10am at the Ocean Inn Motel in Auckland. We were still picking up some of our group who were delayed as troubles occurred with our rental vans. Lucky enough we had Ruth Tai helping us to get ready for our Powhiri that had to be moved to Hato Petera Marae because of weather conditions. The welcome ceremony led by Ojasvin Kingi’s Mum and Dad, sisters and brothers and Mokopunas went deep into our hearts, worlds where meeting and the beginning of the interweaving had started. On Wednesday we traveled north and visited by surprise the beautiful Art Factory in Te Hana and their giant swamp Kauri Taonga. We were warmly received and the theme of our tour was also announced. We were made aware that our Grandmothers Healing Haka journey north was outlined along the spiritual pathway of the ancestors Te Rerenga Wairua. Some of this pathway needed love and tender healing like many of us who felt the call to come on this tour. So we were heartly thanked with tears of joy when we accepted this task, not knowing what this truly meant. Later we visited Tane Mahuta, God of the forest. Also known as Tane Whakapiri - the great ancestor tree who unities us all. At the mouth of the Hokianga harbor in Omapere we were suddenly informed that our Marae in Otiria, where we were suppose to sleep that night, was already occupied by a Tangi - a death ceremony. So we learned about the meaning of death in the Maori culture and Tangi, which has first preference to access a Marae. We had no place to stay. But the Whanau Whenua with all their creative will power were ahead of us arranging for us shelter for the night, in an old Pub now transformed into a church. The first sleeping all together was a unique experience for most people and the next morning we had our first sharing, Whakawhanaungatanga after Maori tradition to bring us more together as a family. Early in the day we went up to Ojasvin’s homestead in Orauta to prepare Mau Rakau sticks for the next day. In the afternoon we could then arrive on the Otiria Marae and settle in for two nights. It was a very exiting moment when everyone could choose an ancestor to sleep beneath. Many of us went swimming in the nearby waterfall with the locals and then after all the men created an exciting game of rugby touch. The next day was great with Kopa, who taught us how to use the Mau Rakau. In the afternoon we could learn from Marama how to make Poi and to how to dance with Poi. To recover from the long day we went to soak in the hot sulfur pools of Ngawha. On Saturday morning Michael (Bubba) guided us into the Porowini, the house where there are many photos of ancestors who are buried up on the sacred Urupa Maunga Rangi. After we visited the old Orauta primary school where Ojasvin’s grandfather, his mother and himself together with his brothers and sisters once had spent many hours learning. It was a great place to train Nana’s Haka before going up to visit her grave on the ancestor hill over looking the valley. Then we packed up again and headed further north to Ahipara the beginning of 90mile beach, where we were welcomed on the beautiful Roma Marae. Sunday was a healing day for all of us. Atarangi and Bill visited us and gave Mirimiri and Romiromi to over 16 people whom they massaged while we were holding the energy by dancing and singing around them. Waiariki rain and the gentle winds were also a great help on that day. After a good deep sleep we got ourselves going up to the sand dunes, to experience a wonderful welcome by Ngati Kuri, with beautiful Haka and songs and great fun on the boogie boards, we heard old stories of the ancestors living on that land once around green kauri forests. After a great swim on a paradise beach just up the road we were finally on the cape. Modern lavatories had been erected to accommodate for more tourism directly on the sacred pathway of the ancestors. We saw the sacred tree hanging into the water, where the traveling souls glide into the water to journey back home to Hawaiki Nui. To honor them we created a small ceremony and performed the Pou Uira Haka to the setting sun. On Tuesday morning we left Roma Marae in a big rush to catch the boat in Paihia to see the dolphins. We arrived in good time because of a breakdown of their toilets, but just like us the dolphins seemed tiered. It was amazing to see them asleep gliding in synchrony through the water. In the evening we landed in Ngunguru at uncle Hone and Tania’s batch on family land of Ojasvin’s grandfather, where we had the honor to create a new Okorohanga where the women where allowed to speak during the welcome ceremony. It was both challenging and a blessing to receive three Swiss ladies streaming the ancestors for the great Goddess and the God. The next day we had the opportunity to join uncle Hone for a walk upon the ancestral land and listen to the great stories. After energy exercises we were able to go on a little trip on a Waka Ama, paddling up and down the river Ngunguru. We then started preparation for the big ceremony for the next day, what lead us into a late night sharing of great healing accompanied with a big storm with heavy rain. So it was a complete surprise when the sun was shining bright and clear the next morning, filling our hearts with love and happiness for a new day. We all did our final preparations. Thanks to the rain we were able to even make a big fire to have a great Hangi, a traditional way to cook food. Once the Hangi was in the ground we went down to the beach. The men first, awaiting the ladies, welcoming them with a Wero by the young warriors and the ladies calling out to them. Our grandmother Rangi placed the Grandmother stone for us to perform the Goddess water ritual on the sand looking out to Toka Tara the sacred woman rock out in the horizon. The women where dancing in the circle while they where carried by the men surrounding and protecting them with Mau Rakau. All together we then walked over the sand dunes and to the Pohutakawa tree below mountain Rangi Korero, where Carole guided the union ceremony. She led this in a great and lightful way that included everyone. Then we all had to hurry back, as the Hangi was ready and the food was waiting for us. On the back of the trailer with Whanau the freshly married couple rode back to the batch. The food was great and the stars where bright and beautiful and singing carried us through into the night. After another good short sleep we packed up the next morning, had a last swim in the lovely water on that extra ordinary beach. After we had a great lunch with wine and photo’s under the Puhutukawa tree we went up to mountain Rangi Korero where we offered the Pou Uira Haka to honor the God before we left to travel back to Auckland. With full hearts, full of experience and little sleep we returned to Auckland City. We were welcomed on the AUT Marae in central town with the direct view to the city tower. Worlds came together and wanted to be integrated as fast as possible. Like in all the Marae’s we were asked again to help in the kitchen to be part of the Whanau Whenua and their huge work which was great as they swiftly adapting to many different cooking enviroments. Our Whanau Whanui was so wonderful and lovely to help too. For our last day we went shopping at Otara market in south Auckland with pacific atmosphere and in the afternoon we trained for our closing night. About twenty visitors came to join us for our sharing. They experienced a rich and powerful night loving the yummy food and the dynamic cultural exchange with the Haka dual being the highlight. After our visitors had left already lying in bed we had our private sharing. With little sleep in our pockets we got up, packed up, had breakfast and had a last rounding among the global Whanau, then we were fare welled by the Whanau Whenua. We were all tiered but happy, and full to the top with unique experiences and gifts that we shall treasure for life. Our Grandmothers Healing Haka tour 2010 was an initiatic journey toward more healing assisting individuals to experience being grounded and rooted and embraced by family of Aroha. We were accompanied many times by the Kahu-hawk and the Waiariki rain as Tohu-signs reminding us that there was a greater plan happening. We had a strict Swiss schedule that was constantly changing like the weather and was beyond our control. This was sometimes challenging for the Whanau Whanui, consisting of young families with their young children, families with teenagers, couples, singles, people from USA, Mexico, Russia, Switzerland, Germany, Australia, Aotearoa and Sirius B, as well as for the Whanau Whenua, who were catering and hosting us on each Marae. The constantly changing conditions, the challenges beyond our daily routine gave us possibilities to come together and to experience and appreciate each other’s differences. As many of us know, some of our realities and lifestyles are manicured in such a way, that we are missing a big part of the living dynamic that nature is offering us each and every moment. Together as humanity and a global family, let us create a positive future for our children’s children. From death come Okorohanga, a new creation bringing life. Marae: Otiria, Roma, Ngunguru and Te Purengi AUT. Fairy falls, Piha, Tane Mahuta, Hokianga. Otiria falls, Premo Beach, Te Rerenga Wairua, Ngunguru. Once upon a time in a land right here, a global family, a family of light and harmony, drove down a dusty winding road to discover paradise. In this paradise, every gift of Mother Earth is so proudly on display. A clear deep ocean, rich with the delicious flavours of the sea. Sweet water bubbling from a spring nestled beneath a sacred blessing mountain. Nearby, a strong mountain pa, Rangi Korero, rises up from the sandy spit. Here the sky speaks to the land and the gods pause to hear the prayers of the people. From this mountain top, the people past had been held safe through many changing seasons and cycles of the moon. 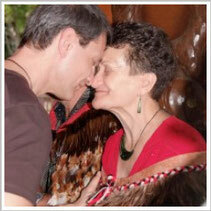 Living in this paradise, is an earth angel, Uncle Hone and his wife, Aunty Tania. Uncle Hone is like the land, both gentle and strong, he wears the cloak of the guardian, his passion for this land like diamonds shining in his eyes, his loving heart beating together with the rhythm of the earth, his feet treading in soft reference to the ground below. For years she had travelled the world, seeking and yearning, to be called back time and time again to the land of her birth, only to leave once again on her restless quest. Uncle Hone extended an invitation to the family of light, an invitation to walk with him on this land. The woman felt a spark ignite deep in the garden of her heart. With gentle wisdom, kindness and a gracious heart, Uncle Hone led the intrepid group on a nature ramble like none ever experienced before. Suddenly the land came alive around the woman, as she too softly and with reference walked in the steps of the ancestors. A dawning glided tenderly upon her heart. a welcome, a greeting, an offer.. But she also felt a pain deep within her belly. This pain and sense of shame was born of a remembering. a remembering for what has transpired over the many years since her ancestors arrived and the role that they have played in the story of this nation, in the story of this land Aotearoa. Then she looked up, into the eyes and the heart of Uncle Hone, and there she saw such love, such acceptance and such grace, that her heart soared to the highest of high, the sun broke through the clouds, and it felt right, she was home. PS I did a fire walk this weekend, was such fun, the guy who took us across was incredible, when he says go you go, right accross those coals without a care in the world, the energy he built up and the energy that came into my body as i stood there on the threshold felt just like the haka energy I felt in those last days of our beautiful journey, it was another gift of remembering..
Every time, when we are truthful with our self, new creation is possible. Every time, when we share our fears, hurts and hopes, when we let them be known, creation of new is possible. Every time, when we accept the other as being a mirror of ourself and take them and us into our heart, transformation and new creation come into existence. beautiful as it is - something new grows out of it. healing occurs and our heart fills with divine music. Every time, when we truly connect with mother earth, creation is being restored and we are truly complete.